IMG_1307, originally uploaded by ilovefab4. 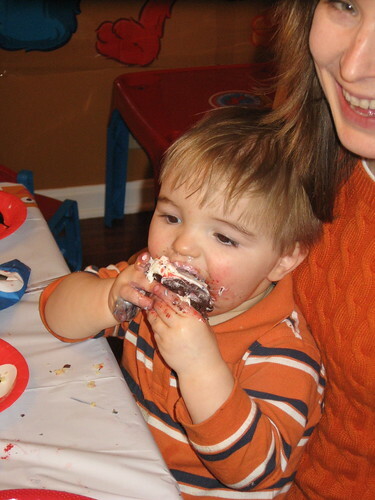 Colin attended Brooklyn's second birthday party and thoroughly enjoyed his chocolate cupcake. In fact, he had a piece of Elmo cake, a chocolate cupcake AND he tried to eat Mommy's cupcake. Colin and his playgroup checked out Recreations Outlet a few days ago. It's a swing set showroom, so we brought the outdoor fun inside. The swing sets themselves are hilariously ridiculous, with most of them selling for 6 to 10 grand ON AFTER-HOLIDAY clearance. I think Colin can have a nice metal swing set with a climbing dome.